1. Bring ingredients (A) to a boil, lower heat and add in coconut milk, custard powder and colouring and bring to a quick boil. 2. Pour jelly mixture into the ball ice-cube tray and cover the tray tightly. 3. Leave jelly to set completely before unmoulding. 1. In a small saucepan, mix in sugar, salt, agar agar powder, pandan leaves and water. Cook over low heat, stirring with a whisk. 2. Once mixture comes to a boil, add in lotus paste and mix slowly until lotus paste dissolves thoroughly. 3. In a bowl combine coconut milk and custard powder. Pour this mixture into the agar agar mixture and bring to a boil. Turn off heat immediately. 4. Pour lotus paste jelly mixture into small cups and top each cup with a jelly yolk in the center. Allow it to set completely. 1. In a pot, combine sugar, salt, agar agar powder, pandan leaves and water. Stirring continuously with a whisk and bring to a boil. 2. Lower heat and mix in condensed milk, coconut milk and colouring. Keep stirring until the mixture starts to bubble. Turn off heat. 1. 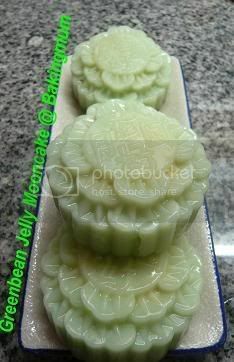 Pour some of mooncake jelly skin mixture into a mooncake mould. 2. Allow to cool until almost set. 3. Place a prepared lotus paste filling in the center of the mould. 4. Top up with more jelly skin mixture and let it set completely before chilling in the refrigerator. 5. Unmould mooncake from mould and keep it refrigerated until ready to serve. I am showing the pictures of the moulds used so that it will be clearer for you. The moulds used for making the jelly eggs and jelly filling. 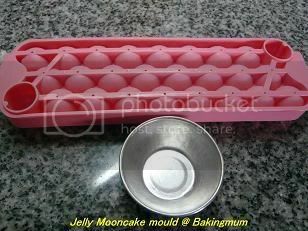 This is the jelly mooncake mould. Thanks very much for posting your recipe. I have a question. Can you please show me the mooncake mould that you use. I bought a mould over the weekend. The one I got has a lever to push the mooncake out. wow! You make your own moon cake. Yummy! It has been many years since I last tasted moon cake. hi baking mum, may i know where you got the mould to make the mock jelly yolks? thanks. Thanks very much for the pics! I will now know what to look for when I go to the store! Hi tricia, no problem at all. is there any reason why you won't reply to my enquiry? 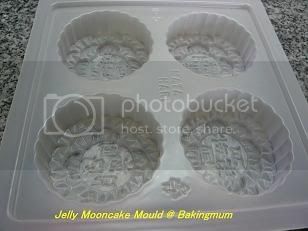 Hi baking mum, may I know where to get the mooncake jelly mould? I went to phoon huat to find but they dont sell... thanks a lot for sharing! Hi Mary-Anne, sorry for the late reply. I got the all the mooncake jelly moulds (including the mock egg yolk mould) from Ng Meng Huat in JB. Not sure if you can find it in other bakeware shops in Singapore. I don't think Phoon Huat sells them. Hi all blogging friends- I manage to find all the moulds in Sun Lik along Seah street-forget the add. They hv all the collections of moulds , books etc. May I know the exact location of Ng Ming Huat in JB. I like to visit this shop but have no idea how to reach the place. Is it very far from the JB custom point. Do I need to travel or within walking distance to reach the bakeware shop. I've been to Sun Lik and supermarkets in Sg but unable to find the rounded ice cube mould for the mock yorks. Any idea where else can i find the mould? Hi Chezzyheart, if I do go the JB and see the mould I will get it for you. May i tobang to buy 2 jelly egg moulds pls? Hi ChezzyHeart, if I do go to that shop in JB I will definitely get two for you. may i know where to buy the lotus paste? is it in canned or? Thank you so much for posting all these amazing recipes. I really really appreciate it (and so does my family). I hope you and your family will have a wonderful holiday season. How can I remove jelly out of plastic, aluminum, steel and glass moulds without breaking? Please email reply to muisim2009@yahoo.com. wish to ask for the filling method point 2 u indicate add in pandan paste but the ingredients part there's no mention of pandan paste. is it the lotus paste instead? Hi shim, yes you are right, it should be lotus paste. Thanks for pointing out. I have amended my recipe accordingly. Can you please take a picture of lotus paste can (container)? I have lotus in can. How can I make it to a paste? Do I need to cook and add sugar? If so, how long and how much? I don't use lotus paste can. I use the paste that comes in a plastic package that you can get from Phoon Huat or other shops that sell bakery stuff. If you want to cook lotus paste from scratch, you can find a recipe in Yochana's blog where she shared her recipe on how to make that. So far, I have not tried making lotus paste from scratch so I won't be able to help you on that. Hi Shim, I put the filling in the fridge for a few hours until it is hard. How many mooncakes will i get out of this? If I remember correctly, I think about 6 or 7 pcs.